Save 10% off selected rudder with the purchase of this kayak - Choose the rudder from the dropdown and the discount will reflect in the cart. Discount does not apply to Wilderness Systems Helix PD Pedal Drive. 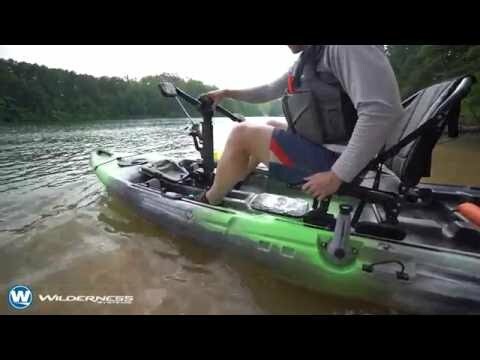 The Wilderness Systems Radar 115 is an exceedingly versatile fishing kayak. It can be paddled with a traditional kayak paddle, pedaled with the new Helix PD Pedal Drive, or powered by the Helix MD Motor Drive. The SMART hull technology combines stability, maneuverability, acceleration, responsiveness and tracking for optimal performance in multiple water environments and configurations. Design elements include an upswept bow for a dry ride, a defined keel line for excellent tracking, a rockered chine for responsive steering and a flat, stable platform for standing and freedom of movement in flat to rough water. The Radar features state of the art outfitting including the SlideTrax rails, multiple storage hatches, and generous rear tankwell storage. The AirPro Max seat is as comfortable as it is functional; its quick-drying, breathable mesh fabric won't fade in the sun, the quick-adjust levers let you slide the seat fore and aft, and it can be stored vertically to open up the deck for stand up fishing. Love this boat overall. Currently, i'm paddling it only. Hopefully i will own the pedal drive in the next few months which is my MAIN reason of buying this kayak. Keep in mind my review is based on paddling only. The commercials sold me on Paddle,Pedal,Power......not a believer in the paddling now. I'm sure the 135 is better by far for paddling. On the 115, tracking is ok (no rudder). The nose rocks side to side when paddling. It does stay straight after paddling though for a bit. Stops pretty quickly.....could be a pro and con. Speed of the boat is ok. Not fast at all and not slow, so again ok. It does catch wind, but an anchor trolley system will fix that problem. Stable.....heck yes! It does turn easy too. Great fishing platform! I fish a lot of narrow creeks, rivers and small lakes in Arkansas, so perfect for my needs. Storage is great! Plenty of mounting options too! Love the pre-install gear tracks. I wish it had some factory fishing rod holders though like some ram tubes or even flush mounts. Of course i have already installed some, but for the price i wish it came with something. When paddling, there is some noise from the two removable pod areas (minor issue) I wish it had smooth covers, similar to the Lowrance-Hobie cover (on a bigger scale though of course) for the fish finder areas to reduce that noise and to protect the transducer. Overall, this kayak is a beast even with the negatives i mentioned (again judging the paddling only). You will feel very stable and comfortable with this amazing seat. I'm fine giving up speed and tracking for a few months until i get the pedal drive. BUT, if you are not planning on getting the Pedal Drive in the future (like soon), i would buy a different kayak for sure unless you fish a lot of moving water. It's a 3 star on paddling speed and tracking. It's a 5 star with the pedal drive. Prior of this purchase i owned a Jackson Coosa. The radar by far is an upgrade in speed, stablility, etc....if that helps anyone too. 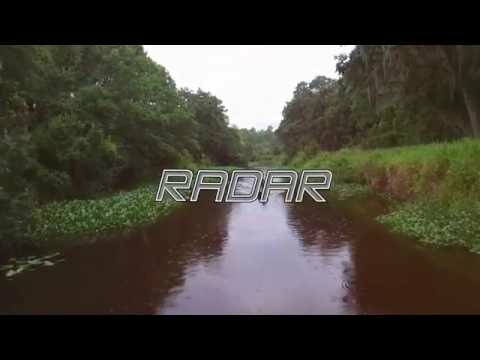 The Radar itself seems to be a great boat, I ordered it and the Helix drive. The install was fairly easy, but there were a few minor hiccups. Great kayak, poor rudder! Love the kayak with pedal drive. Greatly increases travel distance. Rudder mech has changed since initial announcement. It is almost impossible to lower and raise from seated position, obviously complicating launching in shallow water. The angle of the lowering rope in relationship to the actual rudder pivot point is too extreme and binds. This not a minor problem that has an easy fix. Did a lot of research on which kayak would fit my needs. The Radar 115 has all the features that I needed. Width and stability was the main thing. I'm 6'3" 240lbs and I have plenty of room to be comfortable and to stretch out. This is my first kayak and I'm very impressed with it. My first trip out in it was a 10 hour fishing trip. The seat is awesome, I have degenerative disk desease and my back didn't give me any trouble at all and my back was not sore the next day either. So if your looking for a great kayak then this is it..
Really love my Radar 115. Really comfortable and stable. I'm a big guy (6'3" 240lbs) and there was plenty of room to move around and stretch out. I fished for a good 10 hours and never got tired or uncomfortable in the seat. I highly recommend this yak to anyone. Q: Is the listed weight of the boat (82LBS) include the seat? A: This is going to be the full weight of the boat and the seat. Q: In the Wilderness Systems overview video, it says the pedal drive and rudder system is all included. However from your site, it looks like the rudder is sold separately from the pedal drive. Does the kayak come with a rudder if you purchase the aftermarket pedal drive or sold separately? A: I apologize for the confusion, we have asked our marketing department to update the information. But yes, if you purchase the Helix pedal drive unit, then it will come with the rudder. Q: I am in the market for this kayak. I am wondering why the radar is on a closeout sale and how long will it last. Thanks. A: Thanks for your question! This item isn't on closeout, it's just one of the items available as part of our Memorial Day sale. Please let us know if you have any further questions, or if you would like any help placing an order! Q: I noticed that if you buy the the pedal drive separately you receive the rudder with your purchase with no additional cost. The pricing here shows an additional cost for the rudder, does this pedal drive not include the rudder when you buy the kayak and the drive together? A: Hello, With the Pedal drive, the rudder kit is going to be included. Q: Any ETA on when you may get Dusk color option in stock? Thanks! A: Unfortunately, they discontinued the Dusk color, so we will not be receiving any more of those unless Wilderness Systems decides to make that color again. 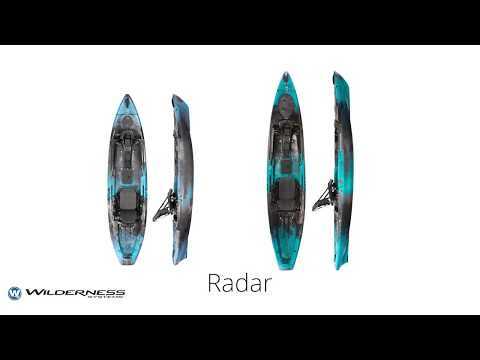 Q: How shallow will the radar 115 paddle? A: It kind of depends on how much weight you have in the kayak. If you have it loaded out close to the 450 pound limit, I would say it will paddle in about 8-12" of water. If you closer to 200 pounds, then you can paddle in anywhere from 4-6" of water. Q: When will the peddle drive be available for ordering? A: We should see these by themselves for purchase within the next 6-8 weeks hopefully. A: Currently we do not have a date set up, but within the next 6 weeks we should have these available. Q: What is the cost on the pedal drive system for the radar 115? A: We have not received the exact estimate as they have not been released for sale on its own just yet. This would most likely be in the range of 700-800 dollars for the unit alone. Q: Does this come with the Helix PD, or is that sold separately? Q: Any word yet on the radar 115? A: This kayak is estimated to be shipping towards the end of December. Q: Are y'all still expecting the radar 115 this week? A: These were shipped out 11/7, we are expecting to have these in within the next 1-2 weeks.